If you are planning to visit Ukraine on business or privately, you may want to establish new contacts prior to coming to Ukraine. Placing advertisement about yourself or your business in local printed editions is a good solution, and our clients frequently request this service along with others. You can place your ad only in one newspaper or in a few at a time; also you can combine advertizing in newspapers and thematic magazines, if you'd like to. We suggest you to place your ad to run for a month, and then to renew it monthly. You can request us to change the text of your ads from month to month. Offer for those who are seeking marriage in Ukraine. 20 words. Text only. One city, 4 papers. You will have to allow about 2-3 weeks of time before you receive the first responses to your ad. In most cases, these will be surface mail letters, and it always takes 10-15 days to send regular mail letter from Ukraine to other countries. If you would like to order a "reverse" service, when a Ukrainian assistant would buy newspapers, collect advertisements, process them for you and send you contact information of Ukrainians who placed these ads, you are welcome to request services of Interpreter-Assistant Before or Between Trips to Ukraine. Payment for the services can be made by PayPal or by CreditCard. Contact us to request the service. 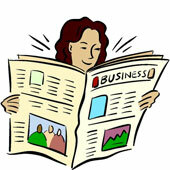 There are commercial newapapers which publish weekly or daily business ads in each city of Ukraine. These papers are very popular among population, for they are free or very inexpensive, they are sold everywhere, and they contain frequently updated information about numerous goods and services. There are also a few all-Ukraine weekly newspapers, which are distributed all over the country, where you can advertize your business. The above packages of services provide costs of placing ads in the inside pages' columns of newspapers or magazines. If you are interested in placing your ad on the cover or title page of a newspaper/magazine, or if you would like to place a large-size colored ad with images, please contact us directly to discuss your request, and we will find the best combination of cost and service for you. Most of all-Ukraine and local cities' papers, as well as a number of magazines for women, have columns called "Znakomstva" (meeting people and matchmaking). These columns are always full of ads placed by individuals who would like to meet with the purpose of dating. Commonly, people place very short text ads (of 20 or 40 words) and provide their contact information (P.O.Box, cell phone number, sometimes email address) and their name. This is enough to make the first contact by surface mail or by phone. Then, they establish correspondence to learn more about each other. This way of making friends is becoming increasingly popular among Ukrainians, especially among those who intend to start relationships and create families. Similar columns are available in a number of popular magazines for women. Magazines are sold in all cities, but they are especially popular in larger cities, among women who like to read about fashion, cosmetics, housework, gardening and cooking. Placing your ad in such magazine is a good guarantee that hundreds of Ukrainian women will read it and consider writing to you. What are the advantages of running ads in Ukrainian newspapers and magazines? 1. This is convenient. There is a vast variety of all-Ukraine and regional advertisement newspapers. Most of them are weekly or daily, and all are very inexpensive or free. They offer the cheapest and the most convinient, frequently updated catalogs of information. 2. This isn't as expensive as other ways of advertising. 3. You can reach out to majority of population just in a few days. 4. You can control amount and intensity of advertisement. 5. You can change contents of your ads as frequently as you need. 6. Your ad will come DIRECTLY into the hands of your addressee.